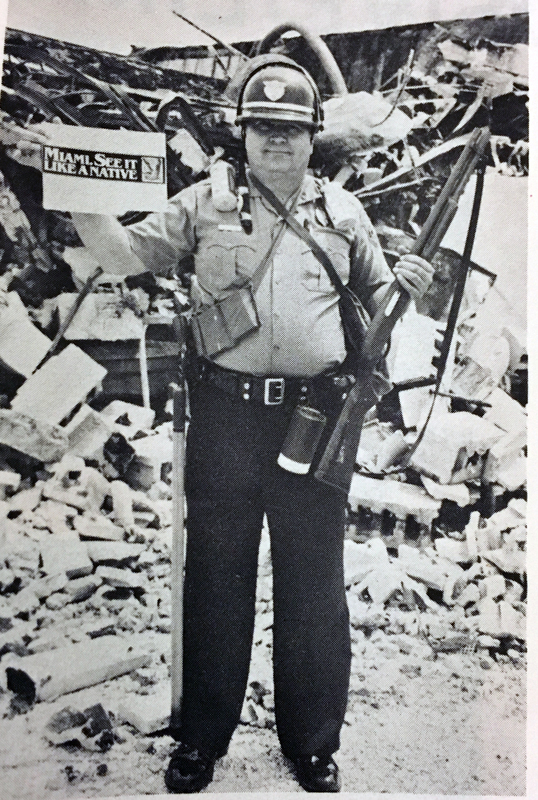 This photo appeared in the July-August 1980 issue of BOLO, the magazine of the Dade County Police Benevolent Association. No photo credit given, but apparently taken by a fellow police officer in a devastated section of Liberty City. I’ve updated the 1980 timeline, mostly adding Mariel-Cuba-US dates that seem to show that the McDuffie case and Mariel were two powerful forces, heading along parallel tracks. One example: Saturday, May 17: In the morning hundreds of thousands of Cubans marched against the U.S. Interest Section in Havana. U.S. Customs announced seizing 97 ships in an attempt to stop the Mariel boat-lift. In the afternoon, a six-man jury in Tampa announced four officers were not guilty on all charges related to the death of motorcyclist Arthur McDuffie. That evening, rioting spread through Liberty City and Overtown, resulting in 18 dead and $100 million in property damage. “The tumultuous Mariel refugee influx of 1980 is back in the news — this time at the core of a roiling debate about whether immigrants hurt less-educated native-born workers. The heated arguments focus on the new work of a Cuban-born Harvard professor, George Borjas, who concludes that Mariel caused a drastic drop in pay among native-born Miami high school dropouts — the majority of whom were black.” That story is available HERE. A companion Herald story discusses the discusses the politics of immigration, including Borjas’ idea of taxing employers who benefit from cheap immigrant labor and how some progressives cite Borjas in rethinking their stance on immigration. That story can be found HERE. Published July 21, 2017. Were Mariel and the riots of 1980 related? Was it possible for two huge events to hit a city in a single year that were completely unrelated, and if they were unrelated, what does that say about the city? Some keen observers, such as author Marvin Dunn, don’t believe that the riots were sparked by long-standing anger in the black community about severe inequities in the criminal justice system, another other things, and that anger had nothing to do with foreigners arriving on boats. Others, such as County Manager Merrett Stierheim and Miami Mayor Maurice Ferre, believe that these two events had to be intertwined on some profound, if not specifically stated, level.